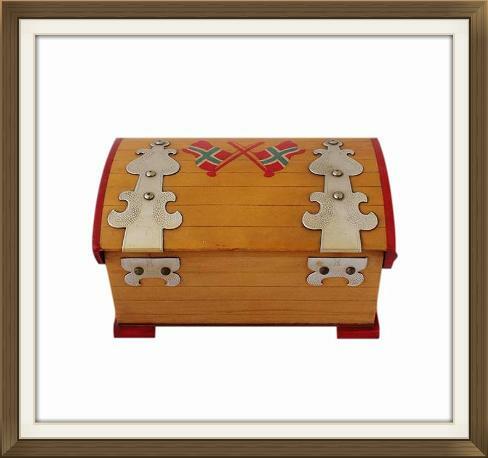 This is a beautiful vintage musical jewellery box, made in Norway in the 1950s/60s. 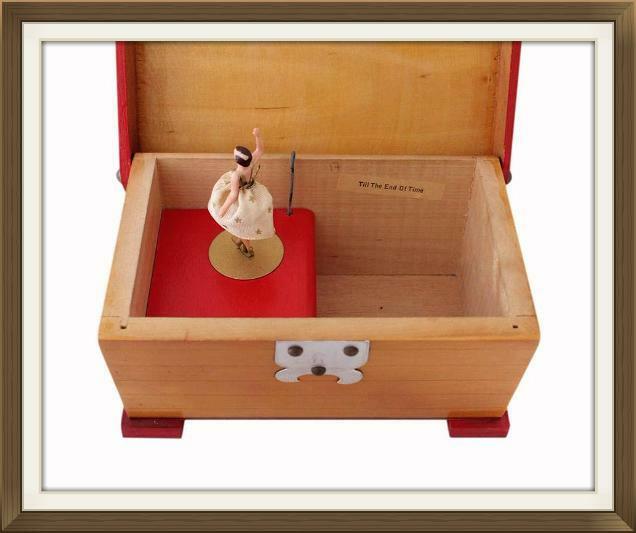 The box is in the form of a (treasure) chest and would particularly suit a young lady. 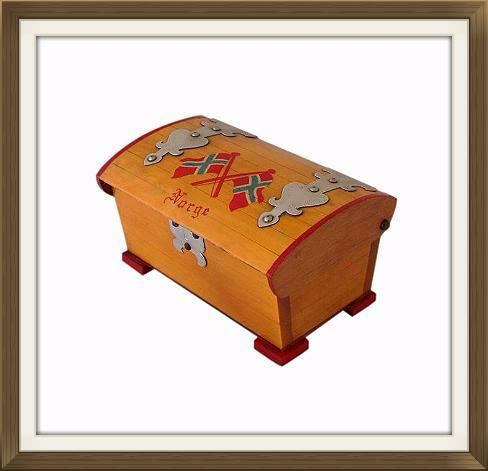 It is made of solid pine and has a beautiful varnished finish. 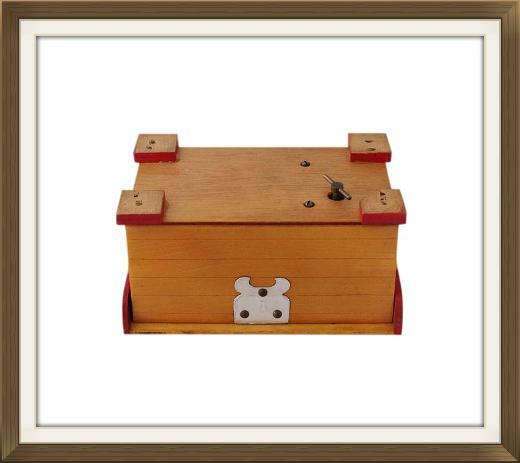 The box is very nicely jointed and has a wonderful pinned opening as opposed to hinges. The exterior has a stylish slat design and beautiful hand beaten faux hinges. It also has a matching hand beaten faux lock. The lid has lovely transfer printed Norwegian flags with Norge lettering beneath. There is beautiful hand painted detail to the edges of the lid and the feet of the box. The lid opens to reveal a beautiful ballerina, situated on the casing to the musical movement. She stands on a hand painted gold disc and moves when the music is playing. She spins around and also moves up and down. 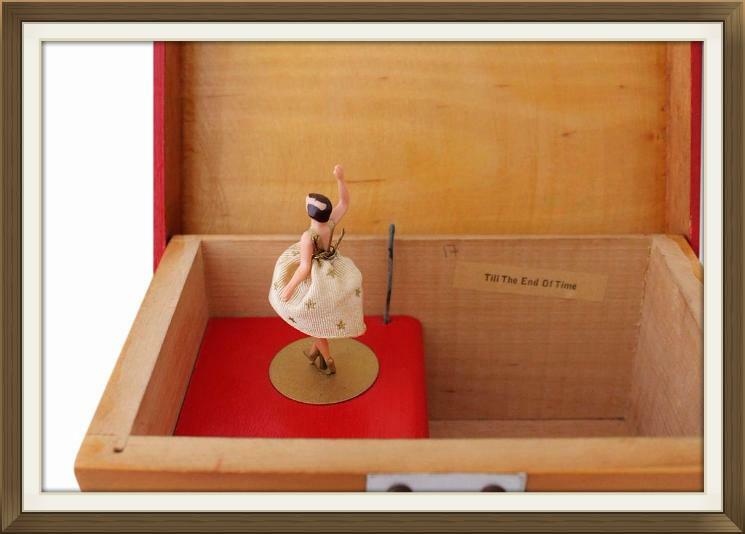 This is a rare movement for jewellery box Ballerina's! The musical movement winds up via a key on the base of the box. It plays the beautiful tune 'Till The End Of Time'. The original tune title sticker is still present on the inside of the box. This lovely box is in excellent condition. It has no damage and only very minor light wear. It is solid and robust, and the tune plays perfectly at the correct speed. There is slight wear to the ballerinas hair which has occurred over time from where the lid closes on it. Occasionally the ballerina won't pop up, but gently rotating her rectifies this. The jewellery in the photos is provided for scale and is not included in the sale. Please use the following measurements to ensure the box is the right size for your requirements. It is the ideal size for a small collection of jewellery. 12.5 by 7.8cm with a 6.3cm depth. International postage is by Royal Mail International Tracked & Signed. Delivery is fast, within 3-5 working days to Europe and 5-7 working days to the rest of the world.